As with all of Guy & O’Neill’s product lines, we put the customer first by conducting market research to understand consumer needs and ensure that what we bring to market is what the consumer truly wants. Consumer insight — combined with years of experience working with major national brands — has driven us to develop products that are equal to or better than the leading brands. Our formulation expertise and high-speed filling capabilities make us an ideal partner for household product manufacturing. In addition to disinfecting wipes and sprays, G&O has contract manufacturing experience with a number of major brands in household categories such as multi-surface cleaners, granite and marble cleaners, stainless steel cleaners, cooktop cleaners, glass wipes and liquid glass cleaners, floor wipes, leather wipes and cleaners, and glue removers. 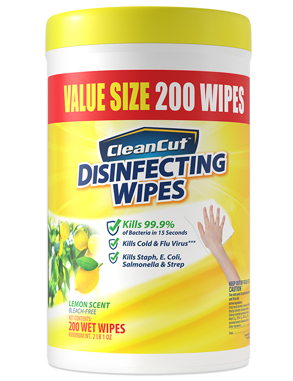 Did you know that G&O has its own brand of disinfecting wipes? Learn about Clean Cut. 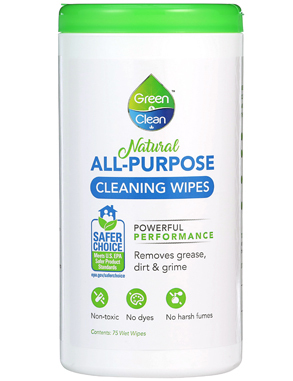 Did you know that G&O has its own brand of green cleaners? Learn about Green & Clean. We have a full line of automotive care products that are comparable to the national brand — and leave many consumer products in the dust. As always, our product development process is focused on shopper and retailer insights. We strive to make the best possible automotive wipes at a fair price to provide good value for the consumer and retailer. Did you know that G&O has its own brand of automotive wipes? Learn about Zippy.